Married Name Her married name was Cable. Name Variation Fannie Frances Edwards was also known as Fanny. Fannie Frances Edwards married John Preston Cable, son of John William Cable and Sarah Ann Minner. Fannie Frances Edwards was born on 18 November 1877 at St. Joseph, Missouri. She was the daughter of James Edwards and Sarah Scammahorn. Name Variation John Preston Cable was also known as John Peyton. John Preston Cable married Fannie Frances Edwards, daughter of James Edwards and Sarah Scammahorn. John Preston Cable was born on 24 January 1876 at Segrada, Missouri. He was the son of John William Cable and Sarah Ann Minner. Frank Bertrand was born circa 1850 at Belgium. He married Mary Augusta Davis before 1925. 1925 Scottsville, Mitchell, Kansas Frank Bertrand appeared on the census of 1925 at Scottsville, Mitchell, Kansas. Joseph J. Coomans was born on 24 December 1876 at Illinois. He was the son of Charles Coomans and Mary Augusta Davis. Joseph J. Coomans died on 10 June 1949 at Kansas at age 72. [S246] U.S. Federal Census 1880 U.S. Federal Census, by Ancestry.com, Year: 1880; Census Place: Papineau, Iroquois, Illinois; Roll: 214; Family History Film: 1254214; Page: 314B; Enumeration District: 139; Image: 0410. Married Name Her married name was Harrison. Nelda Lena Coomans married John Guy Harrison. Nelda Lena Coomans was born on 16 September 1878 at Illinois. She was the daughter of Charles Coomans and Mary Augusta Davis. Nelda Lena Coomans died on 22 February 1958 at Iowa at age 79. John Guy Harrison married Nelda Lena Coomans, daughter of Charles Coomans and Mary Augusta Davis. John Guy Harrison was born on 17 November 1876 at Iowa. He died on 30 April 1952 at Iowa at age 75. Eugeni Coomans was born circa 1871 at France. Mary Coomans was born circa 1875 at Illinois. Name Variation Gertrude E. (?) was also known as Lizzie (?). Married Name circa 1886 As of circa 1886,her married name was Young. Gertrude E. (?) was born in October 1864 at Iowa. She married Theron H. Young, son of Aaron Young, circa 1886. Gertrude E. (?) died before 1918. Gertrude E. (?) had 4 with 4 living in 1900 children. She had 4 with 4 living in 1910 children. [S245] U.S. Federal Census 1900 U.S. Federal Census, by Ancestry.com, Year: 1900; Census Place: Deadwood, Lawrence, South Dakota; Roll: 1551; Page: 72A; Enumeration District: 0026; FHL microfilm: 1241551. [S244] U.S. Federal Census 1910 U.S. Federal Census, by Ancestry.com, Year: 1910; Census Place: Deadwood Ward 4, Lawrence, South Dakota; Roll: T624_1483; Page: 16B; Enumeration District: 0043; FHL microfilm: 1375496. Name Variation Graves C. Young was also known as Grover. Graves C. Young was born in August 1892 at South Dakota. He was the son of Theron H. Young and Gertrude E. (?). Name Variation Gerald H. Young was also known as G. H.
Gerald H. Young was born in December 1897 at South Dakota. Amelia Young was born in September 1886 at South Dakota. She was the daughter of Theron H. Young and Gertrude E. (?). Corine Young was born in March 1888 at South Dakota. Married Name 18 July 1920 As of 18 July 1920,her married name was Elmore. Helen Jerrow was born circa 1901 at South Dakota. She was the daughter of James M. Jerrow and Marian McAlpine. Helen Jerrow married John Francis Elmore, son of John Elmore, on 18 July 1920 at first marriage for her; second for him, Great Falls, Cascade, Montana. Helen Jerrow and John Francis Elmore were divorced before 1940. Name Variation James M. Jerrow was also known as J. M.
James M. Jerrow was born circa 1877 at Scotland. He married Marian McAlpine circa 1900. Name Variation Marian McAlpine was also known as Mary. Married Name circa 1900 As of circa 1900,her married name was Jerrow. Marian McAlpine was born circa 1883 at England. She married James M. Jerrow circa 1900. Marian McAlpine had 5 with 5 living in 1910 children. John Francis Elmore Jr. was born on 31 January 1921 at Montana. He was the son of John Francis Elmore and Helen Jerrow. John Francis Elmore Jr. died on 11 May 2001 at age 80. John Francis Elmore Jr. obtained US Social Security Card at Montana; last residence Carlsbad, San Diego, California. [S250] U.S. Federal Census 1930 U.S. Federal Census, by Ancestry.com, Year: 1930; Census Place: Great Falls, Cascade, Montana; Roll: 1253; Page: 25A; Enumeration District: 0020; Image: 855.0; FHL microfilm: 2340988. 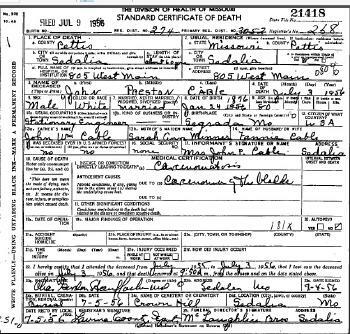 [S373] U.S. Federal Census 1940 U.S. Federal Census, by Ancestry.com, Year: 1940; Census Place: Great Falls, Cascade, Montana; Roll: T627_2214; Page: 6A; Enumeration District: 7-26A. Married Name circa 1921 As of circa 1921,her married name was Stannard. Married Name 2 March 1943 As of 2 March 1943,her married name was Elmore. Ida E. Heckner was born circa 1901 at Avon, Stearns, Minnesota. She was the daughter of John Heckner and Franciska Ach. Ida E. Heckner married Francis Robert Stannard circa 1921. Ida E. Heckner and Francis Robert Stannard were divorced before 1940. Ida E. Heckner married John Francis Elmore, son of John Elmore, on 2 March 1943 at Chouteau, Montana. Ida E. Heckner died in 1978. 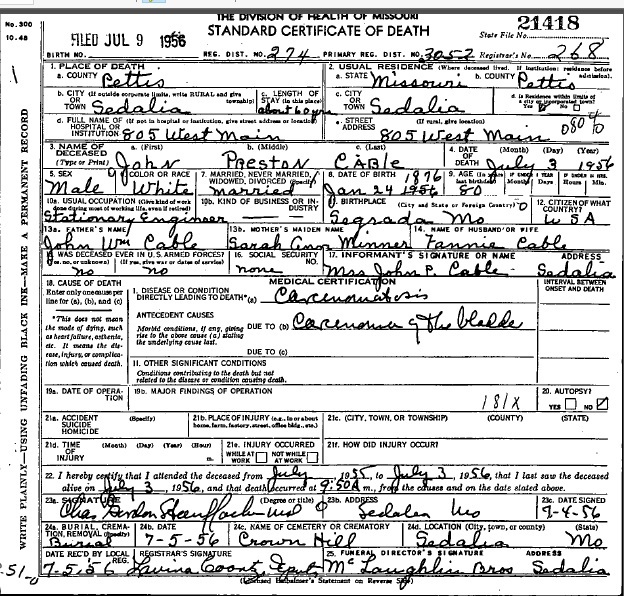 [S250] U.S. Federal Census 1930 U.S. Federal Census, by Ancestry.com, Year: 1930; Census Place: School District 46, Carter, Montana; Roll: 1252; Page: 2B; Enumeration District: 0031; Image: 1119.0; FHL microfilm: 2340987. [S373] U.S. Federal Census 1940 U.S. Federal Census, by Ancestry.com, Year: 1940; Census Place: Great Falls, Cascade, Montana; Roll: T627_2214; Page: 61A; Enumeration District: 7-3A. John Heckner married Franciska Ach. John Heckner was born circa 1867 at Germany. Married Name Her married name was Heckner. 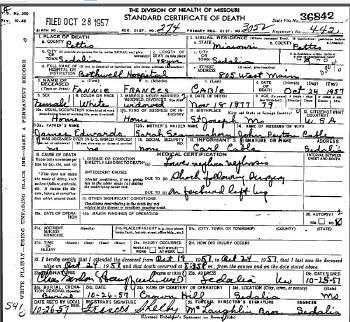 Name Variation Franciska Ach was also known as Frances. Franciska Ach married John Heckner. Franciska Ach was born circa 1868 at Germany. Name Variation Francis Robert Stannard was also known as Frank. Francis Robert Stannard was born circa 1891 at South Dakota. He married Ida E. Heckner, daughter of John Heckner and Franciska Ach, circa 1921. Francis Robert Stannard and Ida E. Heckner were divorced before 1940. Married Name before 1940 As of before 1940,her married name was Elmore. Grace (?) was born circa 1921 at California. She married Francis Archie Elmore, son of John Francis Elmore and Amy Travis, before 1940. [S373] U.S. Federal Census 1940 U.S. Federal Census, by Ancestry.com, Year: 1940; Census Place: Stockton, San Joaquin, California; Roll: T627_325; Page: 62A; Enumeration District: 39-57. Claude T. Ross was born circa 1904 at Illinois. He was the son of E. C. Ross. Claude T. Ross married Floretta Bell Woodrome, daughter of George W. Woodrome and Anna McClain, on 12 June 1926 Floretta Woodrome and Claude Ross wedding announcement. [S250] U.S. Federal Census 1930 U.S. Federal Census, by Ancestry.com, Year: 1930; Census Place: Ewing, Franklin, Illinois; Roll: 516; Page: 2B; Enumeration District: 0028; Image: 930.0; FHL microfilm: 2340251. Name Variation Narcissa Ferne Simmons was also known as Fern. Married Name 25 December 1935 As of 25 December 1935,her married name was Woodrome. Narcissa Ferne Simmons was born on 25 August 1899 at Illinois. She married George Henry Woodrome, son of George W. Woodrome and Anna McClain, on 25 December 1935. Narcissa Ferne Simmons died on 15 May 1991 at Illinois at age 91. Married Name 7 September 1940 As of 7 September 1940,her married name was Brewer. Anna Mary Schroeder was born on 24 July 1923 at Illinois. She was the daughter of John Henry Schroeder and Harriet A. Woodrome. Anna Mary Schroeder married Kenneth Howard Brewer on 7 September 1940. Anna Mary Schroeder died on 31 December 1999 at Illinois at age 76. She was buried after 31 December 1999 at Lipe Cemetery, Makanda, Jackson, Illinois. Kenneth Howard Brewer was born on 28 September 1917 at Illinois. He married Anna Mary Schroeder, daughter of John Henry Schroeder and Harriet A. Woodrome, on 7 September 1940. Kenneth Howard Brewer died on 20 March 2000 at Illinois at age 82. Married Name 11 June 1960 As of 11 June 1960,her married name was O'Connor. Betty Lou McPherson was born on 29 March 1933 at Platteville, Grant, Wisconsin. She was the daughter of Clifford S. McPherson and Florence E. Miller. Betty Lou McPherson married Kenneth G. O'Connor on 11 June 1960 at Illinois. Betty Lou McPherson died on 5 October 2015 at Kenosha, Kenosha, Wisconsin, at age 82 Age 82, of Kenosha, passed away peacefully on Monday, October 5, 2015, at United Hospital Systems-Kenosha Campus with her loving family by her side. Born on March 29, 1933, in Platteville, WI, she was the daughter of the late Clifford and Florence (Miller) McPherson. In 1959 she moved to Kenosha. On June 11, 1960, she married Kenneth O’Connor in Waukegan, IL. He preceded her in death on June 21, 2007. Betty was employed as an accounting clerk for Eaton Corporation for over 25 years until her retirement in 1988. Married Name 26 December 1952 As of 26 December 1952,her married name was Linden. Ida Marie Langkamp was born on 13 June 1930 at Wisconsin. She was the daughter of Leonard John Langkamp and Violet Elizabeth Kreiser. Ida Marie Langkamp married Thomas Linden on 26 December 1952. Ida Marie Langkamp died on 11 February 2016 at age 85 Ida Marie Linden, 85, of Bethany Home, formerly of Orchard Drive passed away on February 11, 2016 at Bethany Home. Funeral mass will be at 11:00 a.m. Monday February 15, 2016 at Holy Spirit Parish, Holy Trinity Church with Rev. Kyle Digmann officiating. Family and friends may gather after 9:00 a.m. Monday at the church until time of mass. Burial will be at a later date in Calvary Cemetery, Platteville, WI. Leonard Funeral Home & Crematory, 2595 Rockdale Road is assisting the family. Ida Marie was born on June 13, 1930 in rural Wisconsin the daughter of Leonard and Violet (McClain) Langkamp. She graduated from Browner School rural Platteville, WI. She married Thomas Linden on December 26, 1952 in Platteville, WI. He preceded her in death on August 29, 2013. She worked for and retired from Ruegnitz Drug as a bookkeeper. She was a member of the Altar and Rosary Society, and Catholic Daughters of America at Holy Trinity Catholic Church. Ida Marie was devoted to her Catholic faith. She enjoyed being outdoors tending to her flowers, attending family gatherings, and spending time with her grandchildren. She is survived by her two Sons, Kevin (Deb) Linden, of Dubuque and Brian (Darla) Linden, of Bellevue. Grandchildren, Heidi (Travis) Haas, of Farley, Taylor, Tyler and Tara Linden, of Bellevue. Her Sister, Lorraine (Herb) Hottenstein; Brother, Clifford (Darlene) Langkamp; Brothers-in-law, Bob Burbach and Tom Dolter. Very special friends; Dr. Heyo and Cam Tjarks, John and Jill Rokusek, Homer and Jeanette Lindholm, Dr. Richard and Helga Van Iten. She was preceded in death by her Husband, a Daughter in infancy Mary Gabriel, Sisters, Velma Dolter and Blanche Burbach, and a Brother Kenneth Langkamp. Married Name Her married name was Burbach. Blanche G. Langkamp was born on 23 November 1932 at Wisconsin. Blanche G. Langkamp died on 14 December 2012 at age 80 Blanche G. Burbach, age 80, of Mineral Point, passed away peacefully at her home on Dec. 14, 2012. Blanche is survived by her husband, Robert W. Burbach; three children, Linda (Phil) Crist, Ron (Mary Ann) Burbach, and Mike (June) Burbach all of Mineral Point; six grandchildren Brad (Sarah) Crist, Sara (Brad) Burmeister, Joe Burbach, Mindy (Ryan) McConnell, Tony Burbach, and Apryll (Garrett) Wang; five great-grandchildren, Taylor, Cole, and Cooper Crist, Bowyer Burmeister and Ryley Burbach. Blanche is also survived by her daughter-in-law Ginny Burbach, and her sisters and brother Lorraine (Herb) Hottenstein, Clifford (Darlene) Langkamp both of Platteville, and Ida Marie (Tom) Linden of Dubuque, Iowa; and many nieces, nephews, relatives and friends. A Mass of Christian Burial will be held on Tuesday, Dec. 18, 2012, at 11 a.m. at Ss. MARY AND PAUL CATHOLIC CHURCH in Mineral Point. Father Monte Robinson will officiate. Burial will be in St. Mary's Cemetery. A visitation will be held on Monday from 3 p.m. until 7 p.m. at the GORGEN FUNERAL HOME in Mineral Point, and on Tuesday from 10 a.m. until time of service at the church.